Posted June 11, 2018 & filed under Metrics & Cross Selling. Would you like to drive more interest and sales of your product and service offerings? It could be as simple as prompting your member for their email address so they can take advantage of hearing about weather related late openings or your next member event. Or perhaps you have a really special loan promotion that is targeted for a select group of members? Sharetec Cross Selling is just one of many effective tools available to aide member satisfaction and grow your value proposition. 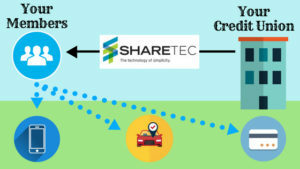 Sharetec provides your credit union with the tools that can help your credit union leverage its technology investment to amplify desired behavior and drive results. Combine Sharetec’s embedded Metrics along with Cross-Selling to promote your capabilites. With the Sharetec Cross Selling feature turned on, credit union staff can be prompted to promote key products and services to members at chosen times when performing transactions or through member facing products such as Home and Mobile Banking. Sales scripts can also be created for staff to ensure consistency in the delivery of your promotions. Promotion attempts and results are then tracked providing management with follow up tools. One of those tools, Contact Manager provides an efficient way for the credit union to record member requests for information into a shared database that can be accessible to all employees. Management can track the progress and response time for follow-up and employees can talk intelligently to members on call backs without asking the member to repeat themselves. Technology should play a critical role in the success of your modern credit union and its ability to meet sales and growth objectives. For more information on how Sharetec’s Metrics, Cross Selling and Contact Manager features can help your credit union, contact us today at simplicity@sharetec.com.